If you wish to recommend any interviewees or take part in letting our Nenuno Creative community get to know you in the future then please get in touch with us here. 1. Hi Scott, It’s a great pleasure for you to take your time out for the Nenuno Creative readers, we are eager to hear your responses. Firstly, would you please quickly introduce yourself to our readers. Thanks for having me Jared! I’m Scott, I’m a web and graphic designer from upstate NY and I have been building web sites since tables and animated gifs were cutting edge. 2. We know you as being a part of the design company sum(design.) How did you come to be a part of this great company? and what is your day to day role within this company. I founded sum(design) back in the Spring of 2009, after spending several years in the corporate world as a Global Manager of Information Systems. Fancy title, huh? The idea was to get away from all of the crap that comes with working for a corporation, and do things my way. This summer Erik Straub (@brickattack) joined as a partner in the firm. Having Erik on board is a HUGE help. Trying to run a business by yourself in this day and age is incredibly difficult, so having someone like Erik on the team is a blessing. As far as day to day role, I handle most of the frontend and UI design and development work, and Erik handles the bulk of the backend. The nice thing about us, is that we’re able to handle all of the processes, so we’re able to jump around if need be. 3. You describe sum Design as ‘not your average design form’ what makes your company stand out from the rest of the companies out there? Well, I think one of the main things that differentiates us is our experience. Not just on the design and development side, but also in the business world. See.. I’m your classic entrepreneur. My great-grandfather owned a business. My grandfather owned a business. My mother has owned a flower shop my entire life. I literally grew up in business, in the flower shop. I learned customer service, color theory, and how to run a business. I’ve watched how marketing and advertising works, or doesn’t work. So, I have a great sense of how businesses operate, and ways that we can help clients overcome the usual pitfalls that people face. The thing is… we always try to actually help our clients. We don’t want to be one of those cookie cutter design firms that just throws up a web site for someone, uses up their budget, and moves on. We want to do things that actually matter, and that make sense for them. If they have a tiny budget for all of their marketing for the year, we want to make sure that budget is spent appropriately, and could actually help them grow. 4. We know from your previous interview with chris trude, that you live in a secluded environment, and can find it hard to keep clients coming. Would you say thats the biggest disadvantage of being in such a secluded environment? as opposed to living in the city for example? The secluded environment comment was kind of a joke. We’re based in Schenectady, NY, which is comparatively a small city, but there’s opportunity here. However, being an assumed outsider is a big disadvantage because it’s hard to break in to the established cliques in the area. 5. What have been some of your most exciting projects whilst working at Sumdesign? Do you prefer a certain type of client or is a paying client the best type? 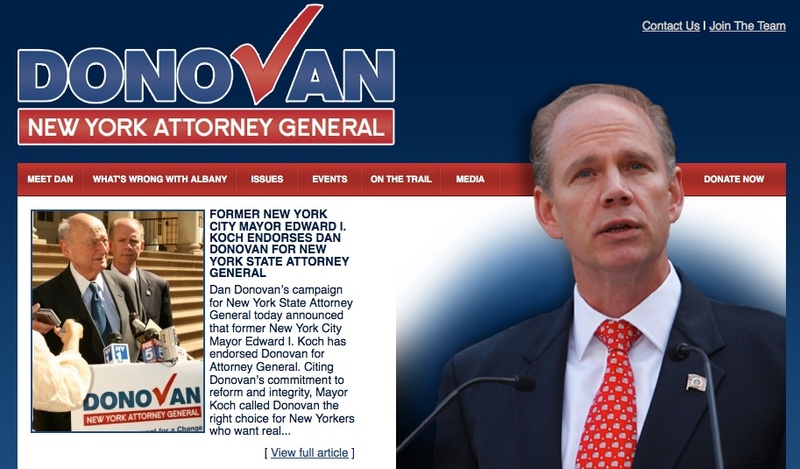 My favorite project to date has to be the Dan Donovan campaign — http://dandonovan.org. He’s running for Attorney General of New York. I’ve been working with some interesting people on that account, and my contacts are an absolute pleasure to deal with. We work with a large array of clients because a major portion of our business comes in from other web firms who need someone to handle their design and/or development for them. Obviously a paying client is always best, right? hehe Honestly though, my preferred client is someone who I actually think that I can help make their business even just a little more successful than it already is. I’m definitely not in this for the money, I absolutely love to help people achieve their goals and dreams. I consider myself successful when I’m able to do that. 6. Whats your background in design and creativity? Did you have a more formal route through education? or did you pick up design at a later age? My start in the creative world was, as I was saying before, hanging out at my mother’s flower shop. Other than that I think a lot of people follow a similar path to mine… I did the whole art school thing, so I’m “trained”. I’ve thrown a lot of that out the window though, because I’ve found that most of the things you learn in school aren’t really very useful in the real world. So, I went from college, to working at a supermarket stocking fruits and veggies in the produce department. During that time I started breaking my old Packard Bell PC to see if I could fix it, started fixing other people’s PCs, and eventually worked my way up to being a head technician at a local PC repair shop. From there, I made the natural progression to programming, and then to the web. I’ve owned and operated a web business twice now, giving up the first after my daughter was born (she’s 9 now) to join the corporate world. 7. What role does social media play with your in your working life? and on a more personal level when you don’t have your working head on? One thing about owning your own business is that you never really take off your work hat. A lot of people don’t pay attention to that. Whether you’re Tweeting at 2AM, or out to dinner on a Sunday afternoon, or driving down the street, you have to always represent your company. Every person you meet is a potential client, or knows someone who is a potential client. I find it interesting that some business owners play the serious business owner role during the day, and then let loose after 5PM. I can’t do that. Operating that way might work for a while, but it won’t work forever. I’d rather be who I am all of the time. Life’s not like a mullet, you know? You have to pick one style and stick to it. So, back to the question — I think social media plays a huge role in my working life, as it should. I think it should play a big role in every small business owner’s life, actually. Whether you like it or not, the Twitters and Facebooks of the world are out there. Your clients are on them. Your prospects are on them. If you’re not, then you’re out of touch. The world’s literally at your fingertips, so if you’re marketing plan consists only of shutting down your computer and hanging out at like a local bar or something, you’re in trouble. 8. Where would we find you online and what member of the social media community have you found to be your favourite to communicate with? Twitter at @scottglasser, and @sumdesign. Facebook is facebook.com/scottglasser and facebook.com/sumdesign. Does LinkedIn count as “social media”? Still trying to figure that one out… anyway linkedin.com/in/scottglasser. Crystal ball time… 2011 seems so far away! I hope to have… a decent Mac Pro, with a couple of 27″ Cinemas. I’ll be happy to have a 27″ iMac though. I love my Macbook Pro, but I’m ready for a desktop. I will be…. working on my new iMac? No? I will be helping at least 2 non-profits, or charities expand their fundraising plans to the web. My biggest achievement will be… surviving. They say most businesses fail within the first few years, and considering this economy… survival will make me happy. I hope that sumdesign will… have the revenue to allow us to double our staff. Quick Fire Kill or Save? Here I want you to choose between two people, objects, styles, and other creative icons. Would you kill them off or save them? haha! KILL!!! No, seriously. Please kill IE. Please. Save. Do you have an iPad? You should. Easily the greatest piece of technology I’ve ever owned. I’d like multi-tasking though, please. Bill Gates or Steve Jobs? I don’t want to kill anyone, so I’ll give a bonus response of SAVE to both of these guys. If Steve doesn’t give me multi-tasking on my iPad soon, I may come back and change my response. What is the typical working environment look like for you on a daily basis? and how does it differentiate from your social environment when working at your mac/pc? I spent the first 15 years of my professional life on a PC. Now I am happy to say that I am a Mac. My work environment is mimicked at both my home office and the sum(design) HQ. I carry my trusty 15″ MBP with me everywhere I go (when I plan I working), and the iPad with me everywhere else. For the Macbook I have a 24″ monitor that I hook in to, and code away on there. What exciting developments lie ahead for the rest of 2010 with Scott? I’m working on a couple of passion projects at the moment that I can’t really go in to detail about, but definitely some cool things happening in the 4th quarter of 2010. Pretty excited about them. I’ll be sure to let you know more when I can! If you could drop your work life and live a life where your finances were covered, with no restrictions. What would you go out and do? or would you prefer to continue the work your doing? To be completely honest, I wouldn’t change a thing. I absolutely love what I do, and can’t see myself doing anything else. It is always great to hear from your favorite stars, have you ever thought of being a star for your company. It can be easy as anything, all you have to do is get some excellent certifications, such as the RH302 which is one of the certifications that has gained much popularity due to the areas it covers and the 642-533 is not far behind, it is indeed one of the best. The 642-515 dumps are your way of becoming that hero without putting any real effort. Great interview! It is really useful to get some information of Behind the Scenes of the designers life. Thanks! Thanks pablo, it was definately a great insight! thanks scott, I trust everyone else will find this interview as enlightening as it was for me putting it together. It great to have people taking a bit of time out for us here at nenuno to educate us all on the daily life of a hardworking designer. Scott was a brilliant interview to put together, I think we can all learn something from his brilliant responses. thanks for checking the interview out giorgia.